bits-en-pieces: SampleRoomPH Free Shipping last Valentines Day! SampleRoomPH Free Shipping last Valentines Day! Sample Room treated all their members, subscribers and followers with a free shipping on product items using your earned membership points. So, when I got this image attachment on the email they sent out I hurriedly went to my Sample room account and checked on what items I can avail using my points. The promo treat was on a limited time of four hours only, to search, pick and place order from the check-out. That day I was about to head to the grocery after work to get some toiletries and hair products. And boy I was lucky to get these items for free using the promo from SR! But, it wasn't that easy because the site crashed down and it went on and off. That's what you get when a product site offers free shipping plus getting items for free at the same time. Flocked of users and members was on the site at the same time, no one to blame... haha! But, they say "Patient is a virtue." I patiently and stick to the site and refreshed the page over and over until my checkout became successful. During lunch time the site acted a bit normal and made transaction using my account and informed other members of the family to log in and avail products too. 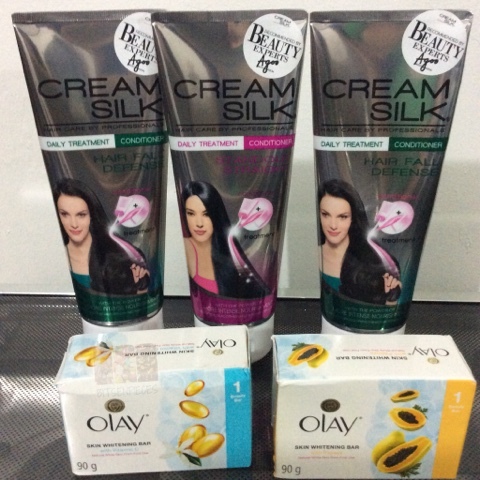 From the three accounts we have we were able to get 4-180ml Creamsilk hair conditioner and 3 bars of Olay whitening soap. 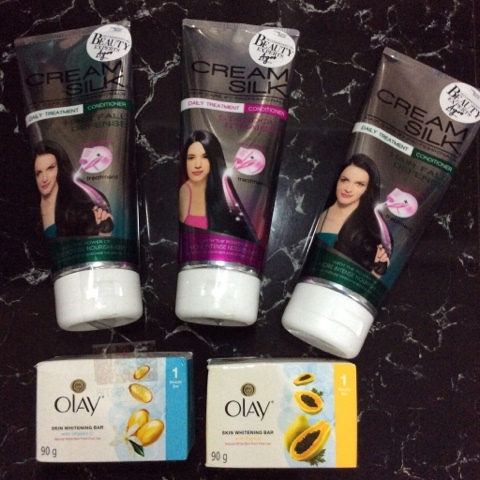 One set of hair conditioner and whitening soap is not included in the photo. Now time to do a product review on the products through my account and earn back the points I used from this purchase and use it next time. Were you able to use the ILOVESR promo code last Valentines day from Sampleroom? What items did you get?